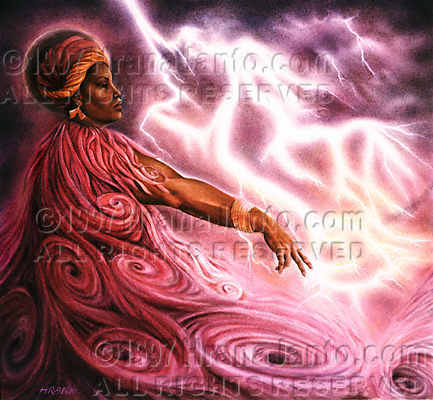 Originally a goddess of the Yoruba in western Africa, she was goddess of storms on the Niger River. Her name means "she tore" in the Yoruba language, for her winds tear up the river's calm surface; she is also called "mother of nine," for the nine estuaries of the Niger. She is a warrior goddess as well as patron of female leadership. Buffalo horns are placed on her altar, for Oya is a water-buffalo when not in human form. Once, it is said, a hunter saw a buffalo shed its skin; the beautiful woman who emerged hid the skin in a thicket of thorns and went to market. The hunter stole Oya's skin, forcing her to become his mate. But his other wives teased her about being a buffalo, and in anger, she killed them and reclaimed her buffalo hide. She stormed out to the fields to find the man who had betrayed her, but he bought his life for some bean fritters-Oya's favorite food. In addition to bean fritters, those who honor Oya offer her palm wine, goat meat and yams. Wednesday is her holy day, when her followers wear dark red beads to please her. When she enters a dancer, the dance becomes frenzied as Oya swings a sword (or a flyswatter). Sometimes she dances with arms outstretched to hold off ghosts, for she is the only goddess who can control them. Oya emigrated with her children to the New World, changing form to suit her new surroundings. In Brazil, she was called Yansa; in Cuba, Olla, in Haiti, Aido-Wedo; in New Orlean, Brigette; she was also assimilated to the Catholic saints Theresa, Barbara and Catherine. A warrior storm goddess who also rules fire, she is one of the great divinities of Brazilian Macumba. In Santeria she is the nine-headed mate of the lightning god Chango. Patron of justice and memory, she is pictured holding a flame. Published by Llewellyn, copyright 1997. Used by permission of the author.